This month sees the 30th anniversary of the closure of Polmaise Colliery 3 & 4, the pit which was first out in the Miners’ Strike of 1984, and last to return when the strike broke in 1985. British Coal announced the closure of Polmaise Colliery on 15 July 1987. Two days later the pit was closed for good and 112 miners were made redundant. This pit head drawing was made in January 1988 by Kelvin Martin, a freelance illustrator for Central Arts. 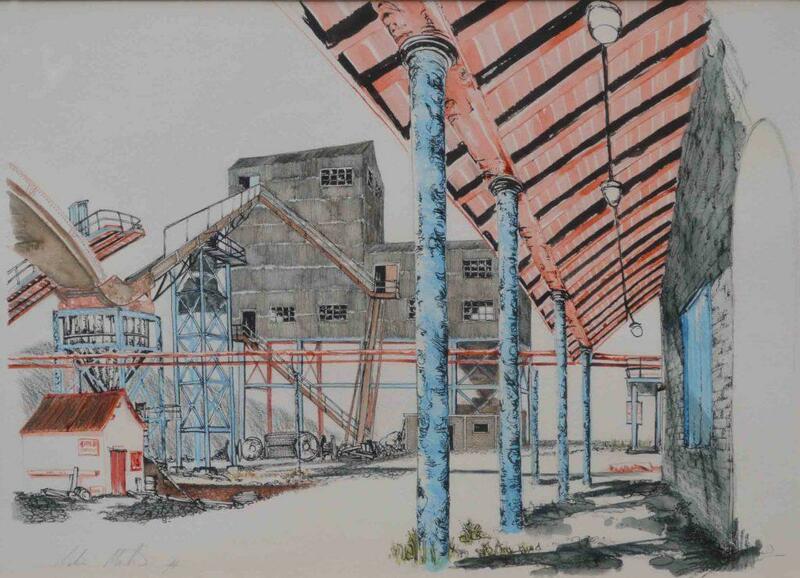 He did the sketch just before the pit head buildings were demolished. Kelvin later was employed by Stirling Council, and in 2016, helped construct the Stirling Mining Heritage website. Polmaise Colliery often broke records in terms of production and profitability, and miners were used to defending their jobs, their pit, and their village of Fallin, created when the pit was sunk in 1904. They were aware that the issue in 1984 was jobs, not pay. There was never a picket line at Polmaise during the 56 week strike. The Polmaise banner, now on permanent display in the Stirling Smith, led all of the demonstrations in Scotland in 1984 -5. The battle of the Polmaise miners was one of the most protracted and heroic in Scottish history and the moral victory was theirs.